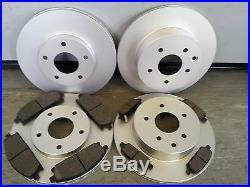 E QUALITY FRONT & REAR BRAKE DISCS & PADS TO SUIT THE FOLLOWING MODELS OF NISSAN. ALL NISSAN X - TRAIL 2000 & 2500 PETROL & 2200 DIESEL MODELS 2000 - 2007. BRAKE DISCS ARE NOW SUPPLIED COATED SO NO NEED FOR BRAKE CLEANER PRIOR TO FITMENT. FRONT SPECIFACTION :- VENTED BRAKE DISCS , 280mm DIAMETER, 28 mm THICKNESS, 49 mm OVERALL HEIGHT, 68 mm CENTRE DIAMETER , 5 STUD FICING HOLES. REAR SPECIFACTION :- VENTED BRAKE DISCS , 292 mm DIAMETER, 16 mm THICKNESS, 62 mm OVERALL HEIGHT, 68 mm CENTRE DIAMETER , 5 STUD FICING HOLES. IF YOU ARE NOT SURE WHETHER THEY WILL FIT YOUR VEHICLE PLEASE MESSAGE ME WITH THE DETAILS. We have a huge variety of car parts for sale all at unbeatable prices. With over 25 years experience supplying car spares there is little that we are unable to supply! I aim to treat all customers how I wish to be treated myself so therefore do my utmost to keep my feedback ratings at an extremely high level. The item "NISSAN X-TRAIL FRONT AND REAR BRAKE DISCS & PADS 2001-2007 NEW COATED DESIGN" is in sale since Wednesday, August 7, 2013. This item is in the category "Vehicle Parts & Accessories\Car Parts\Brakes & Brake Parts\Brake Discs". The seller is "ukdeals4wheels" and is located in SOUTHAMPTON,HAMPSHIRE. This item can be shipped to United Kingdom.